Kenney Mencher: Discussion: How do these terms apply to this painting? Discussion: How do these terms apply to this painting? How do these terms apply to this painting? In the fresco drawn by Pietro Perugino of Delivery of the keys to Saint Peter in 1482 shown different perspectives among it, one of them is linear perspective as the vanishing point or the focus point started from the center of the fresco where the chapel door is, Perugino also used chiaroscuro among the fresco and angling the building to a line with the focus point to give a strong sense of unison. Atmospheric perspective is shown where the sky meets the floor as the sky seems far and blur out in distance. Idealism perspective is shown all over the fresco, as the court is empty and lot of places to run around, it is known in the 14th century that Italy was a cram up city and not a lot of places to go around, so it is safe to assume that the fresco is showing the ideal city that Perugino vision. Neoplatonic perspective talks about the hidden symbols or meaning around the fresco, as this has the hint of last judgment in it as the left side view of the god while right side are just normal people, while not only the people in front are like a transition of human to the disciple in the background of the mountain is even like that also, as the right side of the mountain show close and cluster of hinting the man of city, while the left side is long and forever showing the meaning of god goes on forever or eternality. Humanistic perspectives is about the human emotion that been shown in the fresco, or bringing the viewer into the fresco, it is shown that one of the disciple on the left is facing back of us to give us a sense that we are also looking in, the court on the back show people playing around as giving the sense of joy among the fresco. Classical elements are also present in the fresco, as the Roman triumphal arches been placed on both side of the fresco to reference back to the accident Roman. 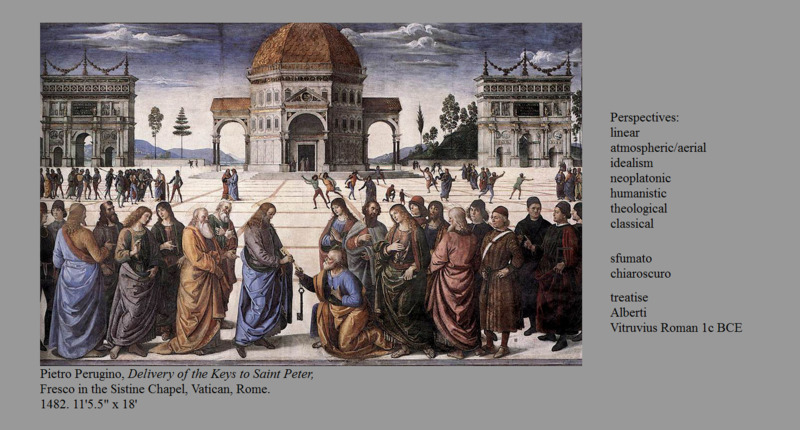 The fresco by Pietro Perugino "Delivery of the keys to saint peter" showed many types of perspectives. One of them is Linear perspective. It uses Linear since the fresco is painted in one point perspective. The one point perspective draws your attention towards the center at the vanishing point; exactly at the building in the center. Atmospheric perspective also applies to this painting. The hills appear to be fading away as they turn blueish in color. This same effect would occur if one were to be looking at some hills in the distance in real life. the hills appear to be blurry and turn blue due to the moister in the air. This painting is also showing idealism because the buildings and open spaces represented in the painting would have not existed in that manner. There really wasn't any open spaces such as this in Italy in the 1400's. Chiaroscuro - there really isn't any dramatic lighting, but light appears to come from the top left. Wonderful! Thanks for posting it on facebook too!